I have embarked upon an extensive and in depth Foreign Policy and International Studies Research Project. 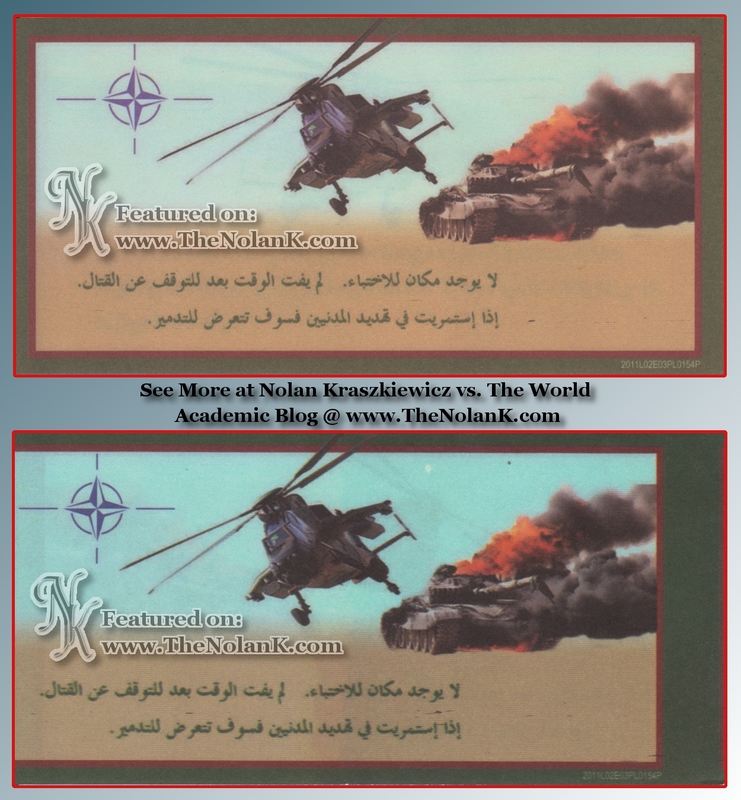 Through a confidential contact in the United States Air Force and the subsequent discussions I had with that contact, I have received recently declassified materials and been made aware of operational details centered around NATO's Operation Unified Protector in Libya. 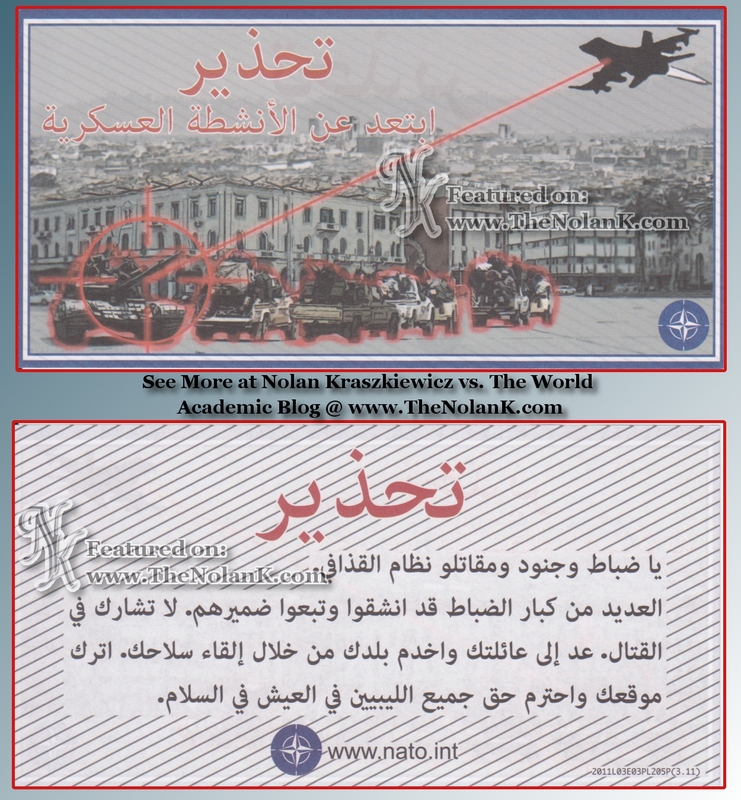 From this I came into possession of the full set of 20 propaganda leaflets that NATO dropped over cities in Libya during the 2011 operations. Through rigorous research and investigations, I can confidently declare that I am in fact the only open source to possess the entire series of leaflets. 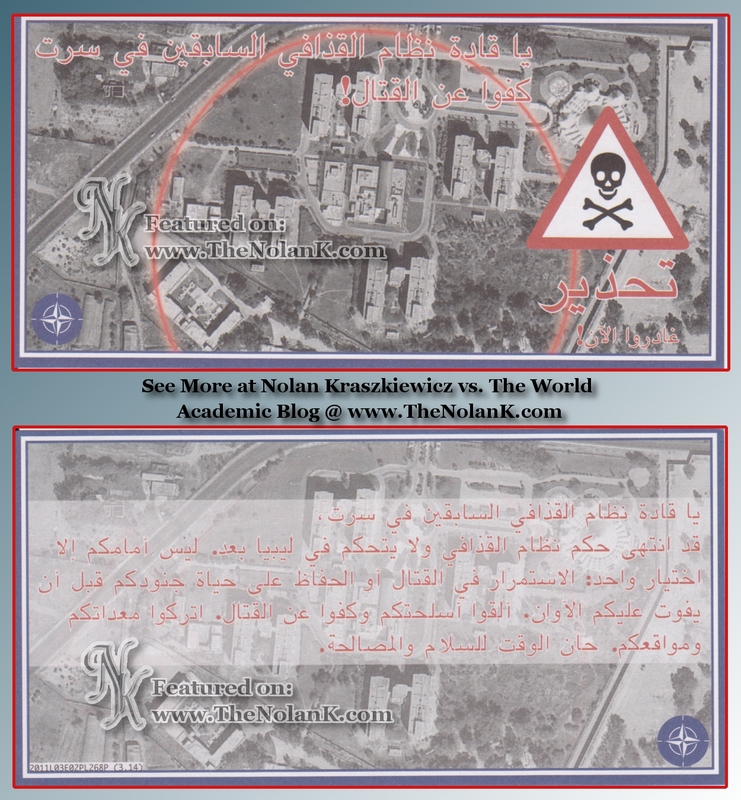 During the summer of 2012, in conjunction with my summer studying abroad in Brussels, Belgium at Vesalius College, I visited NATO's S.H.A.P.E. in Mons, Belgium. I attended a briefing held by the Commander of NATO ACCI. I was then able to discuss the psychological operations that NATO employed during Operation Unified Protector. 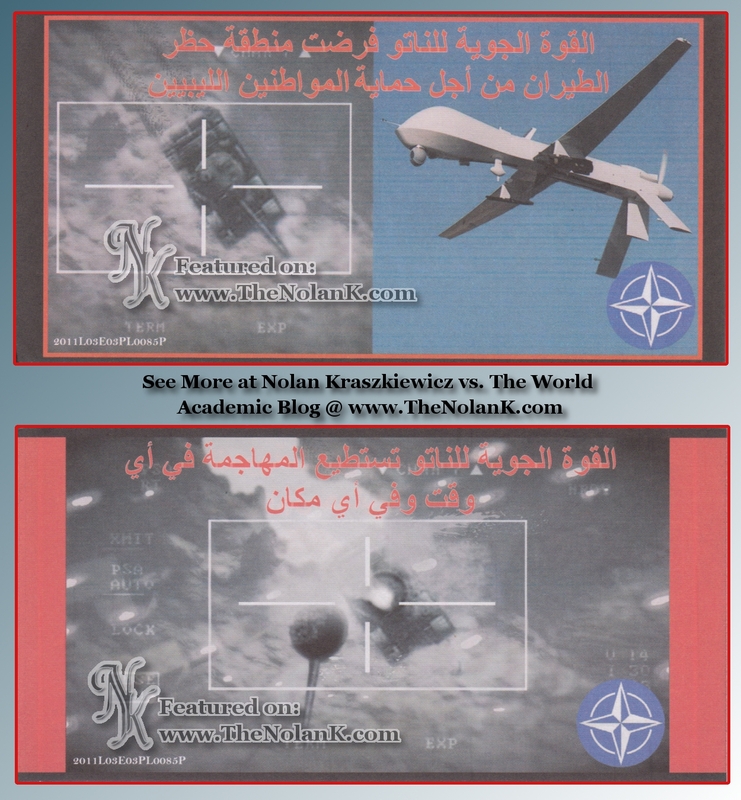 It is a standard practice to use leaflet propaganda in military ops and as such, there really is no objective measurement that can be made in terms of efficacy. 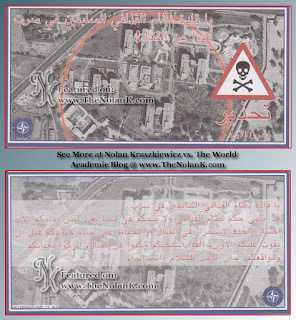 It is just assumed that the leaflets serve to inform civilian populations via crude broadcasting. The assumed benefit is lower civilian collateral damage in the operations theater and to rally support for the intervening force. Furthermore, the leaflets pay future dividends during reconstruction by using nationalist images to inspire the nation [re-]building. The justification for the continued use of this psychological operation is the cost-benefit analysis. The creation, printing, and delivery of the leaflets is a relatively inexpensive consideration on the accounting ledger. This mode of contact is cheaper and more effective for informing local populations over a large land area than attempting to send a foreign liaison in person. Operation Unified Protector began on 31 March 2011. 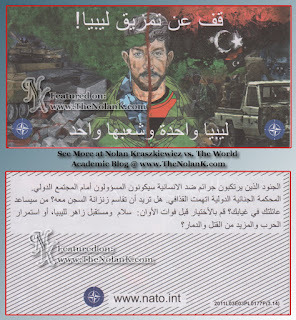 NATO controlled all military operations for Libya under United Nations Security Council Resolutions 1970 and 1973. During the operation NATO used over 260 air assets to conduct over 26,500 sorties, including over 9,700 strike sorties. The ultimate objective was achieved and Operation Unified Protector ended on 21 October 2011. Through this project, I made contact with Daryush Nadimi, a graduate student at the University of California - Berkeley. 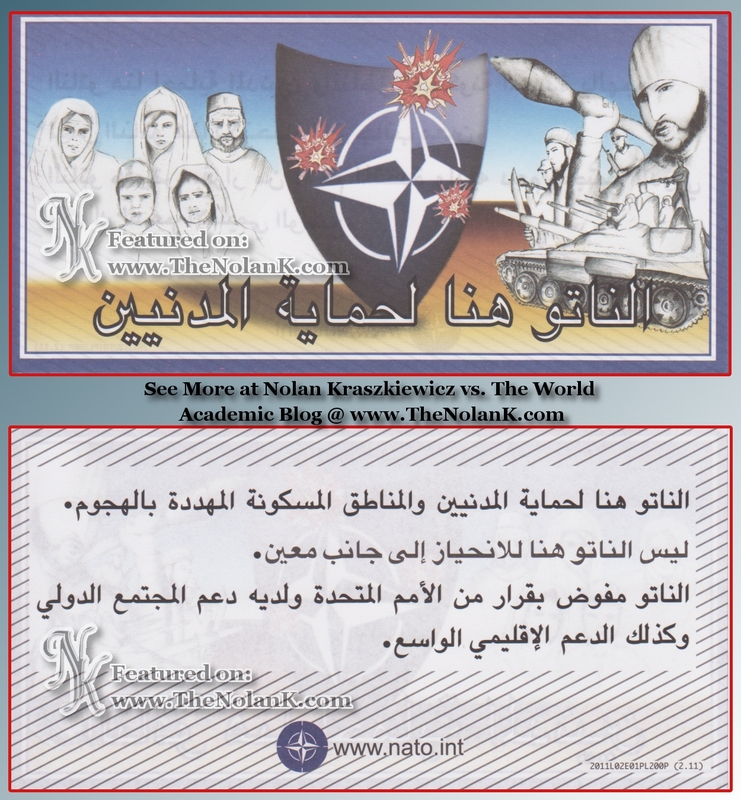 He was embarking on his master's thesis, on the topic of NATO exceeding its civilian protection mandate in Libya. 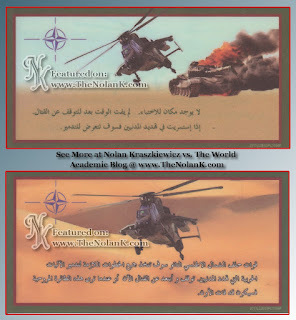 After some communication and conversations, I was pleased to learn that Daryush had incorporated the leaflets as a part of his primary source analysis in his thesis project. His finished product is quite intriguing and he makes some genuinely compelling points. 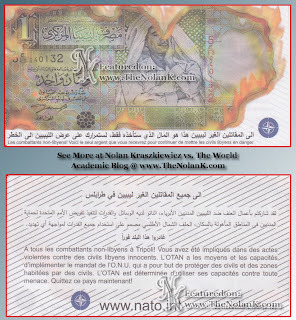 I encourage all to take a look at Daryush's Blog - LibyanUprising.Wordpress.com. I also suggest that those interested in NATO's Operation Unified Protector should read his published thesis "Did NATO Exceed its Civilian Protection Mandate?" [Link Here]. 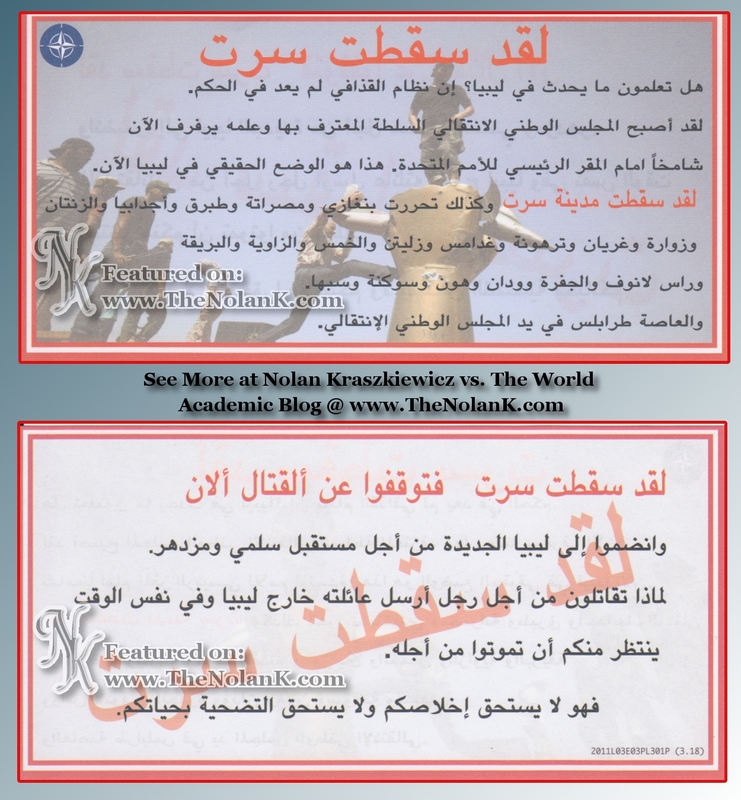 I have posted all 20 of the leaflets here on my blog. All of which are extremely interesting, exquisitely designed, and feature clever witted uses of Middle East Ultra-Nationalism. 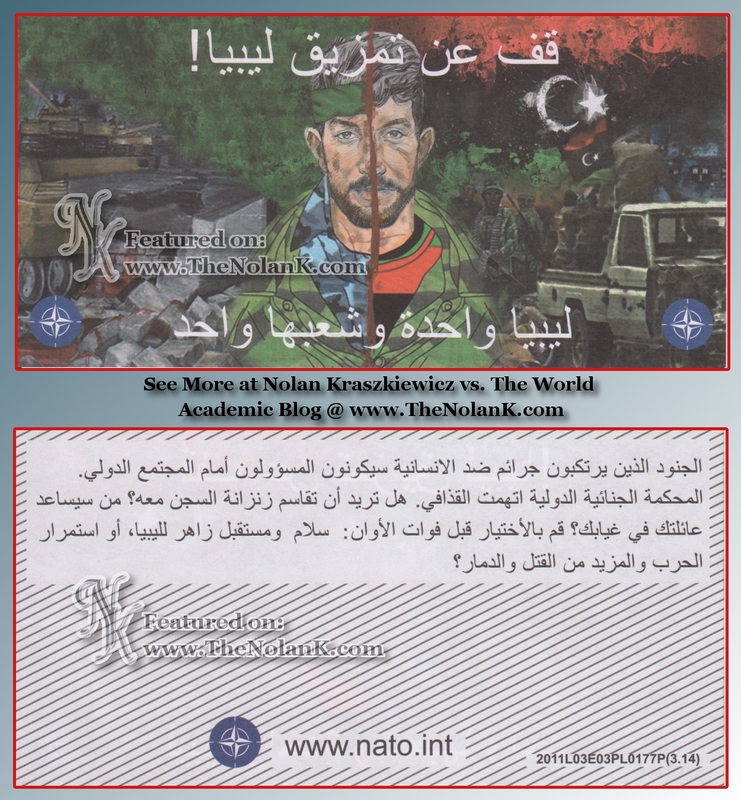 The NATO leaflets are translated and reformatted below. 2. 17 Digit alpha-numeric code present on every flier on at least one side in the bottom right or left hand corner. The 2011 is the year followed by series production code. 3. Three numbers in parenthesis in 15 out of 20 fliers. Batch codes for loading leaflets into dispersal ordnance. The increasing numbers signify a later series. 4. 'www.NATO.int’ web address present on the back of 13 of 20 Leaflets. 5. 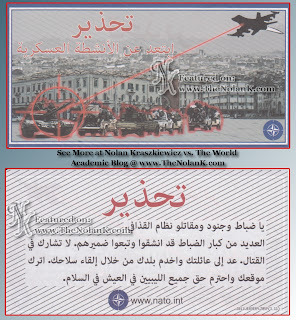 Arabic text present on every flier; 1 with Arabic and French; no other languages. 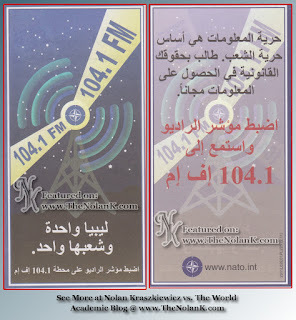 Libya is one and its people are one, turn the dial to station 101.4 FM. The freedom of information is the basis of the freedom of the people. Claim your lawful rights by obtaining information freely (without paying). Turn the needle of the radio and listen to 104.1 FM. Libya is one and its people are one. 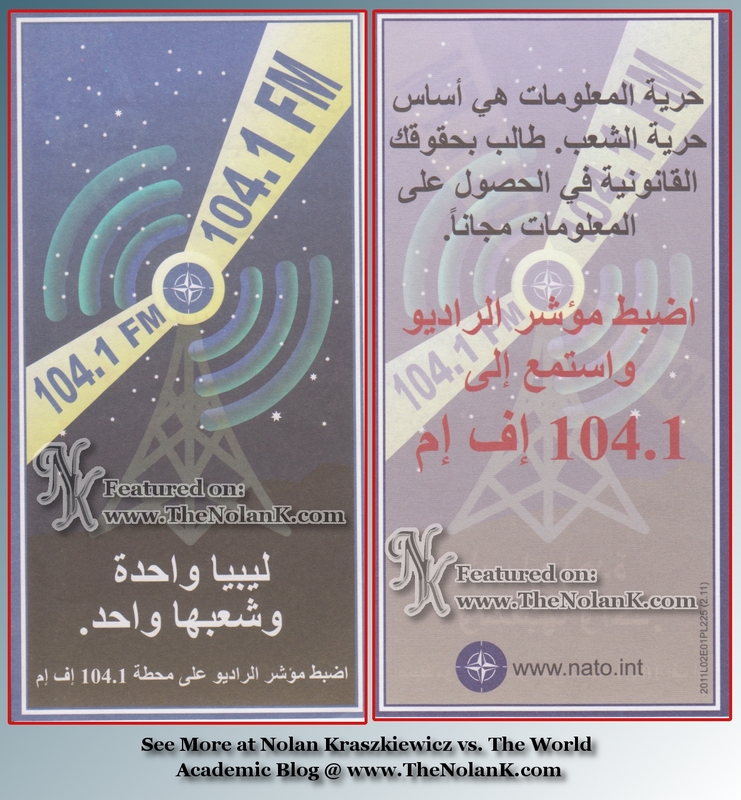 Turn the needle of the radio to station 104.1 FM. 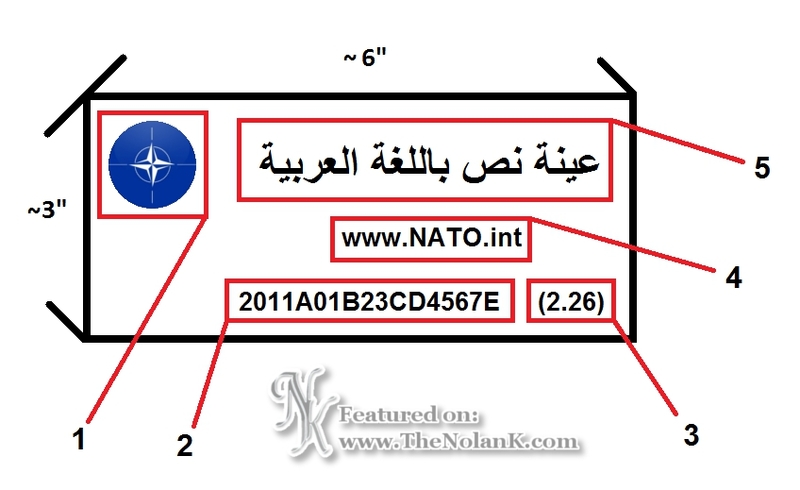 NATO air forces have imposed a no-fly zone for the sake of protecting Libyan civilians. NATO air forces are able to attack at any time in any place. Warning. Keep away from military activities. Warning. Oh officers, soldiers and fighters of the Gaddafi regime. Several high-ranking officers have defected and followed their conscience. Do not participate in fighting. Return to your family and serve your country through throwing away your arms. 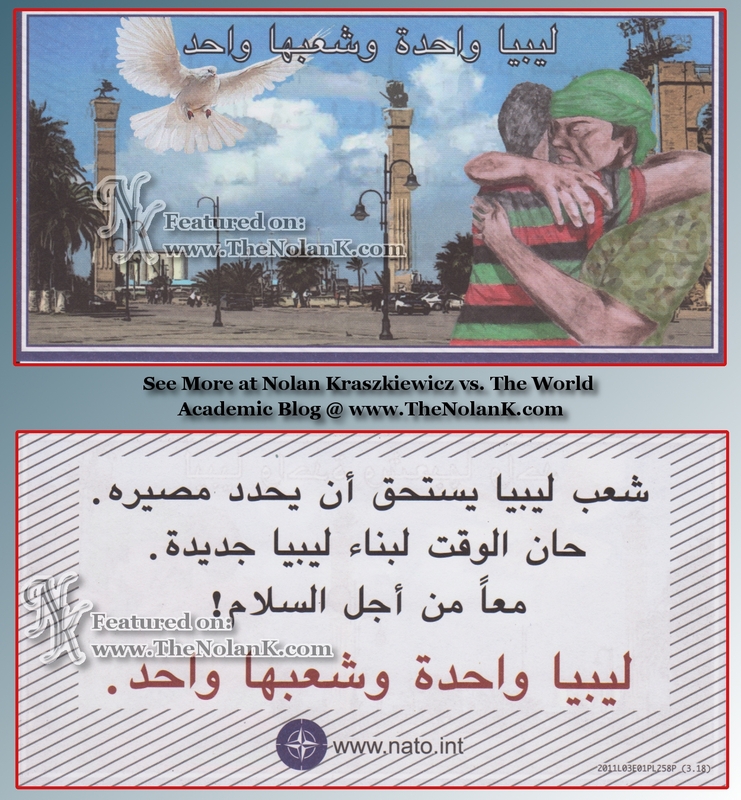 Leave your position and respect the right of all Libyans to live in peace. يا ضباط وجنود ومقاتلو نظام القذاقي. موقعك واحيرم حق جميع اللسبيين في العيش في السلام. Fighters of the former Gaddafi regime in Sirte, The Gaddafi regime is over, and he no longer rules. There is only one choice left to you: to continue killing, or to protect the lives of your soldiers before they run out of time. Throw down your weapons and cease the killing. Abandon your equipment and leave your positions. The time for peace and reform has come. و مواقعكم. حان الوقت السلام و الصالحة. To the non-Libyan fighters (mistake in Arabic here) this is the money that you will only take for your continual putting Libyans in danger. To all the non-Libyan fighters in Tripoli. 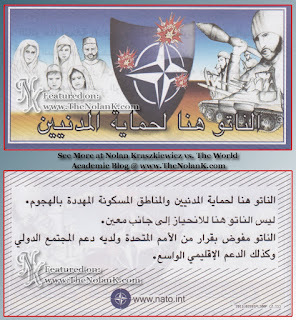 You have participated in violent acts against innocent Libyan civilians, NATO has the means and the capabilities to implement the UN mandate to protect civilians in inhabited areas. NATO is determined to use all its capabilities to fight any threat. Leave this country immediately! لقد شاركتم بأعمال العنف ضد الليبيين المدنيين الأبرياء، الناتو لديه الوسائل والقدرات لنتفيذ تفويض الأمم المتحدة لحماية المدنيين في المناطق المأهولة بالسكان، الحلف الشمال لأطلسي مصمم على استخدام جميع القدرات لمواجها أي تهديد. NATO is here to protect civilians. NATO is here to protect civilians and the inhabited areas threatened with attacks. NATO is not here to align to a particular side. NATO is authorized with resolution from the United Nations and has support of the international community and thus wide regional support. الناتو هنا احماية الدنيين والناطق السكونة الهددة بالهجوم. ليس الناتو هنا للانحياز إلى جانب معين. الناتو مفوض بقرار من الأمم التحدة ولدية دعم الجتمع الدولي وكزلك الدعم الإقليمي الواسع. 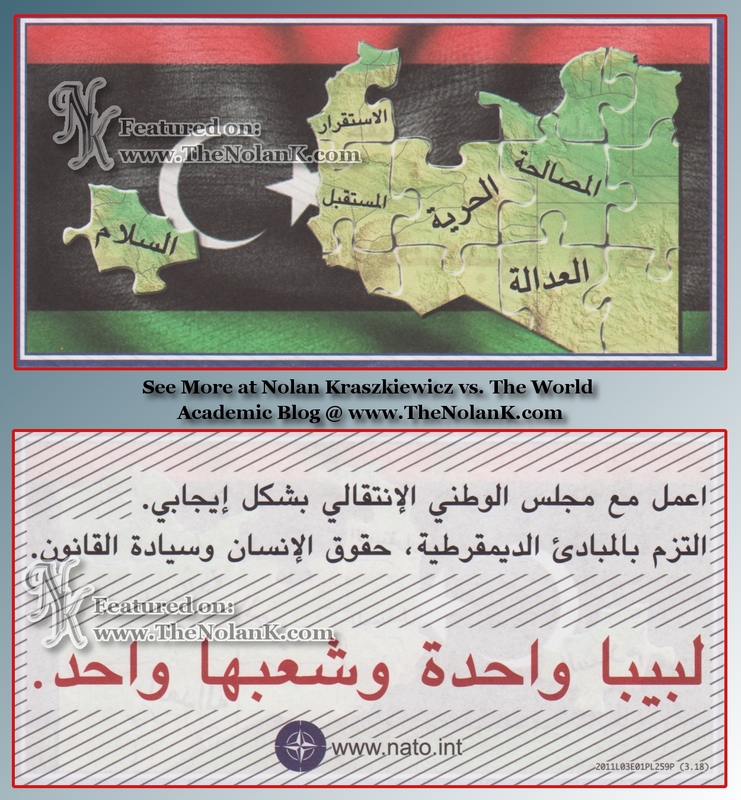 Stop tearing Libya apart! Libya is one and its people are one. The soldiers that are committing crimes against humanity are responsible before the international community. The international criminal court has indicted Gaddafi. Do you want to share a prison cell with him? Will your absence help your family? Make the choice before the time has passed: peace and a prosperous future for Libya or continued war and more killing and destruction? الجنود النين يرتكبون جرائم ضد الانسانية سيكونون المسؤولون أمام المجتمع الدولي. Reconciliation. Justice. Freedom. Stability. The future. Peace. Work with the National Transitional Council in a positive way. Commit to democratic principles, human rights and the rule of law. Libya is one and its people are one. اعمل مع مجلس الوطني الإنتقالي بشكل إيجابي. التزم بالبادئ الديمقرطية، حقوق الإنسان وسيادة القانون. Libya is one and its people are one. Together for reconciliation. The time has come to build a new Libya, a state founded upon freedom and not fear, upon the will of the majority and not the desire of the few. The people of Libya deserve peace. Libya is one and its people are one. وليس رغبة القلة. 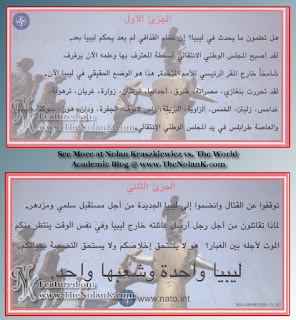 شعب ليبيا يستحق السلام. Oh forces of Gaddafi, this is your chance to stand side by side with the Libyan people and to choose the right road, why die and you’re able to participate in returning peace to Libya? Stop fighting. Libya is one and its people are one. The people of Libya deserves to choose its destiny. The time has come to build a new Libya. Together for peace! Libya is one and its people are one. شعب ليبيا يستحق أن يحدد مصيره. حان الوقت لبناء ليبيا جديدة. Stop fighting! 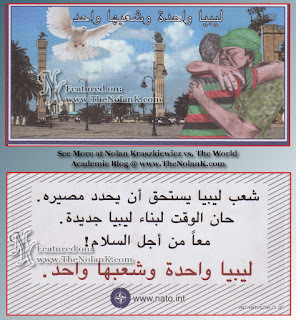 Embrace your Libyan brothers. One Libya one people. Soldiers that are committing crimes against humanity by causing continuing violence and not establishing suitable conditions for a prosperous and peaceful future. Stop the fighting that threatens civilians and inhabited areas. Make a choice before the time has passed – peace and a flourishing future for Libya or continuing war that only brings more trouble and misery to civilians and your innocent families. الجنود الذين يرتكبون جرائم ضد الانسانية يسببون استمرارا العنف ولا يضعم الظروف المناسبة لمستقبل سلمي ومزدهر. قف عن القتال الذي يهدد المدنيين و المناطق المسكونة. قم بالأختيار قبل فرات الأوان – سلام ومستقبل زاهر لليبيا، أو استمرار الحرب التي تجلب إلا المزيد من العناء و الشقاء للمدنيين و لعائلاتهم الأبرياء. Sirte has fallen. Do you know what’s happening in Libya? The Gaddafi regime no longer rules. The Transitional National Council have become the recognized authority and its flag flutters now high above the Headquarters of the UN. This is the true situation in Libya now. The town of Sirte has fallen. And so has been liberated Benghazi, Misurata, Tobruk, Ajdabia, Zintan, Zuwara, Gharyan, Tarhouna, Ghadames, Zliten, Khums, Zawia, Brega, Ras Lanuf, Jufra, Waddan, Hun, Sukna and Sebha. The capital Tripoli is in the hand of the National Transitional Council. هل تغلعون ما يحدث في ليبيا؟ إن نظام القذافي لم يعد يحكم ليبيا بحد. شامخاً امام القر الرئيسي للأمم التحدة. هذا هو الوضع الحقيقي في ليبيا الآن. وراس لانوف والجفرة وودان وهون و سوكنة وسبها. والعاصة طرابلس في يد الجلس الوطني الإنتقالي. Sirte has fallen so stop fighting now. 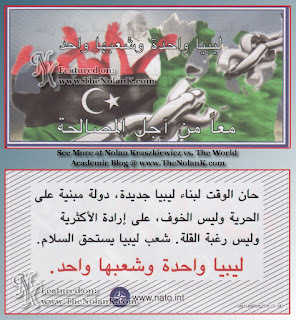 Join with the new Libya for a prosperous and peaceful future. Why are you fighting for a man that sent your family outside of Libya and at the same time waits for you to die for him? He does not deserve your salvation and he does not deserve you sacrificing your lives. وانضموا إلى ليبيا الجديدة من أحب مستقبل سلمي ومزدهر. ينتظر منكم أن تموتوا من أجله. فهو لا يستحق إخلاصكم يستحق التضحية بحياتكم. 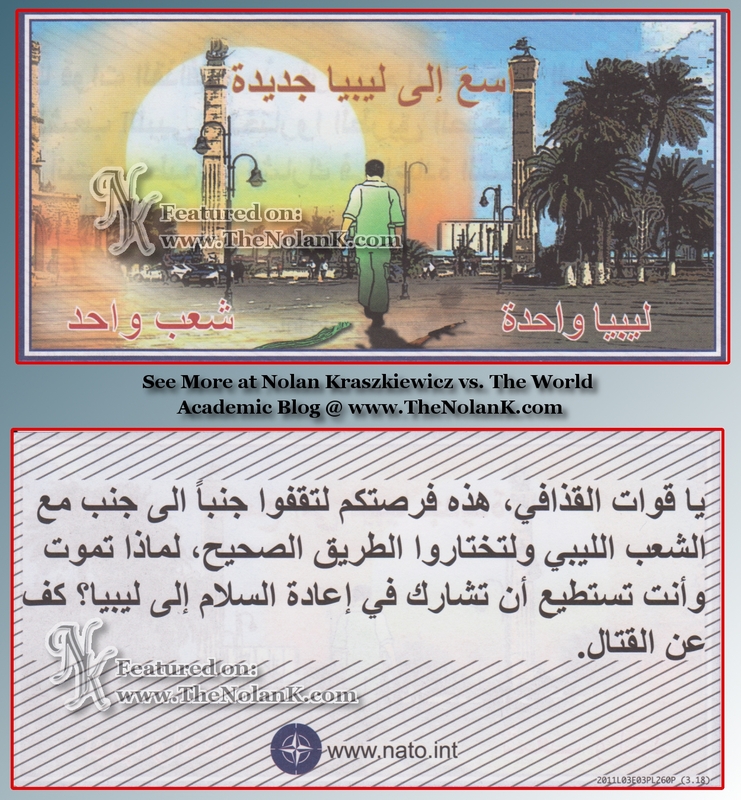 Part One: Sirte has fallen. Do you know what’s happening in Libya? The Gaddafi regime no longer rules. The Transitional National Council have become the recognized authority and its flag flutters now high above the Headquarters of the UN. This is the true situation in Libya now. The town of Sirte has fallen. And so has been liberated Benghazi, Misurata, Tobruk, Ajdabia, Zintan, Zuwara, Gharyan, Tarhouna, Ghadames, Zliten, Khums, Zawia, Brega, Ras Lanuf, Jufra, Waddan, Hun, Sukna and Sebha. The capital Tripoli is in the hand of the National Transitional Council. شامخاً خارج القر الرئيسي للأمم التحدة. هذا هو الوضع الحقيقي في ليبيا الآن. غدامس، زليتن، الخمس، الزاوية، البريقة، راس لانوف، الجفرة، ودان، هون، سوكنة وسبها. والعاصة طرابلس في يد الجلس الوطني الإنتقالي. Part Two: Stop fighting and join the new Libya for a prosperous and peaceful future. Why are you fighting for a man that sent your family outside of Libya and at the same time waits for you to die for him in the dust? He does not deserve your salvation and he does not deserve you sacrificing your lives. Libya is one and its people are one. توقفوا عن القتال وانضموا إلى ليبيا الجديدة من أحل مستقبل سلمي ومزدهر. الوت لأجله بين الغبار؟ هو لا يستحق إخلاصكم و لا يستحو التضحية بحياتكم. ليببا واحدة و شعبها واحد. Hold on to your safety, the rule of the Gaddafi regime has ended, and it does not deserve the sacrificing of your lives. The time has come to build a new Libya – a state founded upon freedom and not fear, upon the will of the majority and not the desire of the few. Throw away your arms and stop fighting and put up a white flag as a sign of your stopping fighting. The world is watching you. 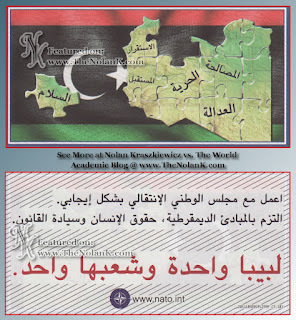 This is your chance to stand side by side with the Libyan people to choose the peaceful course of history. Pass on this piece of news to all those that have not received this message. 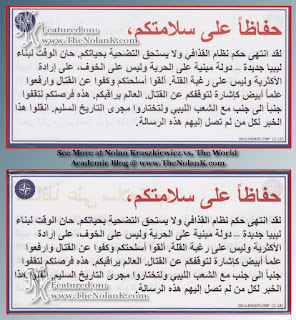 الخبر لكل من لم تصل إليعم هذه الرسالة. 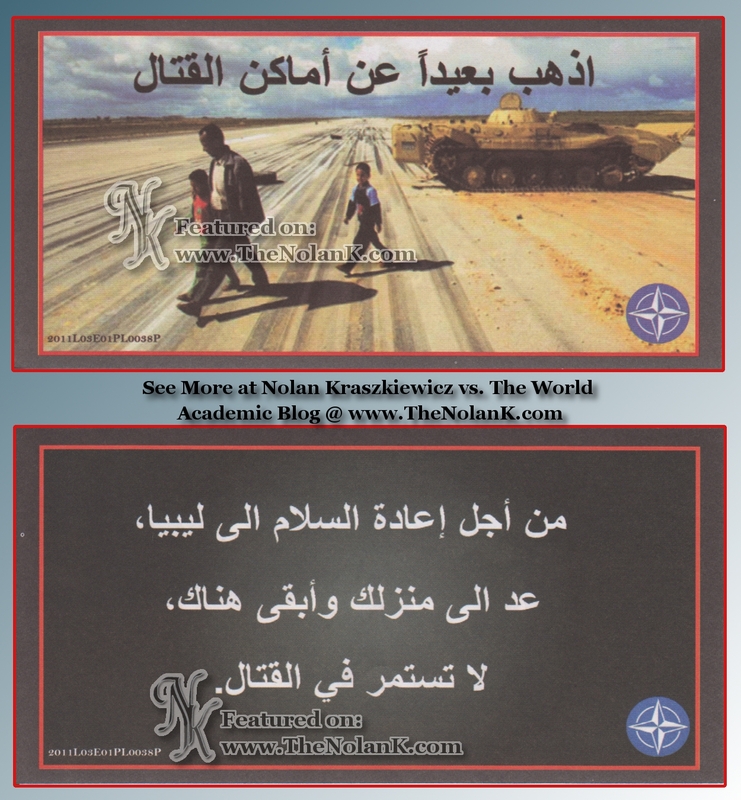 Why are you permitting your Libyan brothers to war and fight against one another rather than living in peace? You are destroying the history of Libya through crimes against humanity. 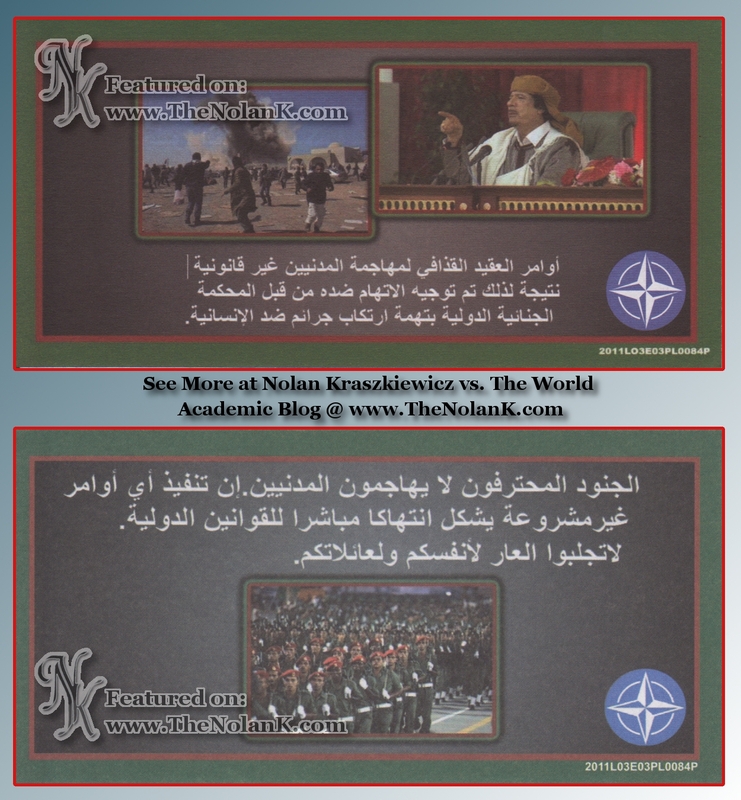 Oh soldiers and officers in the Libyan army, the ICC has accused Gaddafi of committing crimes against humanity in Libya. It’s advised for officers and soldiers of the Libyan army to not execute the orders of Gaddafi and military operations against the Libyan people. If an officer or soldier commits a crime against humanity so he violates international laws. 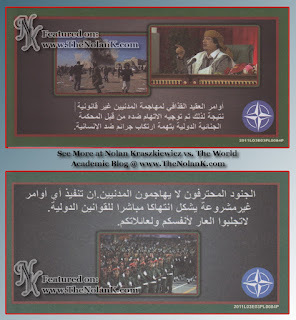 A number of Libyan officers and soldiers chose a position against orders of Gaddafi to not kill innocent civilians. Join these men for a peaceful and prosperous future in Libya. و العمليات العسكرية ضد الشعب الليبي. اذا كان ضابط أو جندي قد قام بارتكاب جرائم ضد الانسانية فقد انتهك القوانين الدولية. العديد من الضباط والجنود الليبية قد أختار و موقف ضد أوامر القذافي لعدم قتال المدنيين لأبرياء. انضهو مع هو لاء الرجال لمستقبل مزدهر و سلمي ليبيا. 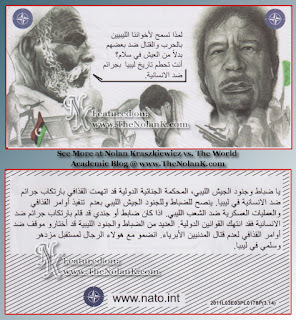 Orders of colonel Gaddafi to attack civilians are illegal, resulting from that the indictment against him has been sent by the international criminal court with the accusation of committing crimes against humanity. 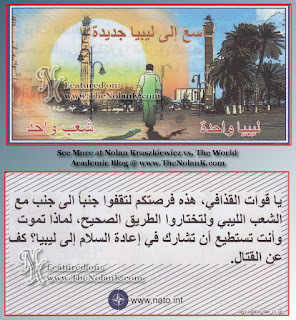 الجنائية الدولية بتهمة ارتكاب جرائم ضد الإنسانية. Professional soldiers do not attack civilians. Executing any illegal orders is direct perpetration of international laws. Do not bring shame upon yourselves and your families. غسرمشروعة يشكل انتهاكا مناشرا للقوانين الدولية. 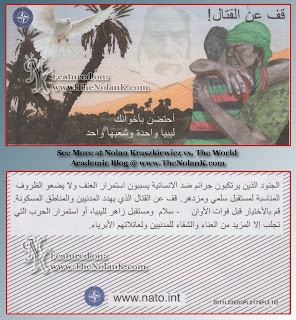 Stop fighting now and spend time by Libya towards peace and prosperity. Go far away from the places of fighting. 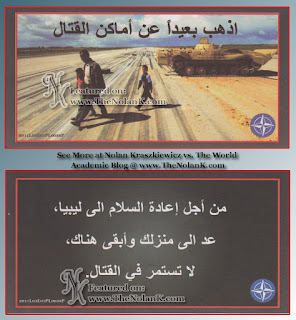 To return Libya to peace, return to your house and stay there, do not continue fighting. There is no place to hide. The time has not yet passed to stop fighting. If you continue to threaten civilians then you will be subject to destruction. Back = same as the front. 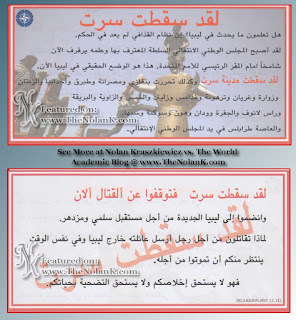 لا يوجد مكان الاختباء. م يفت الوقت بعد التوقف عن القتال. إذا إستمريت في تهديد الدنيين فسوف تتعرض التدمير. 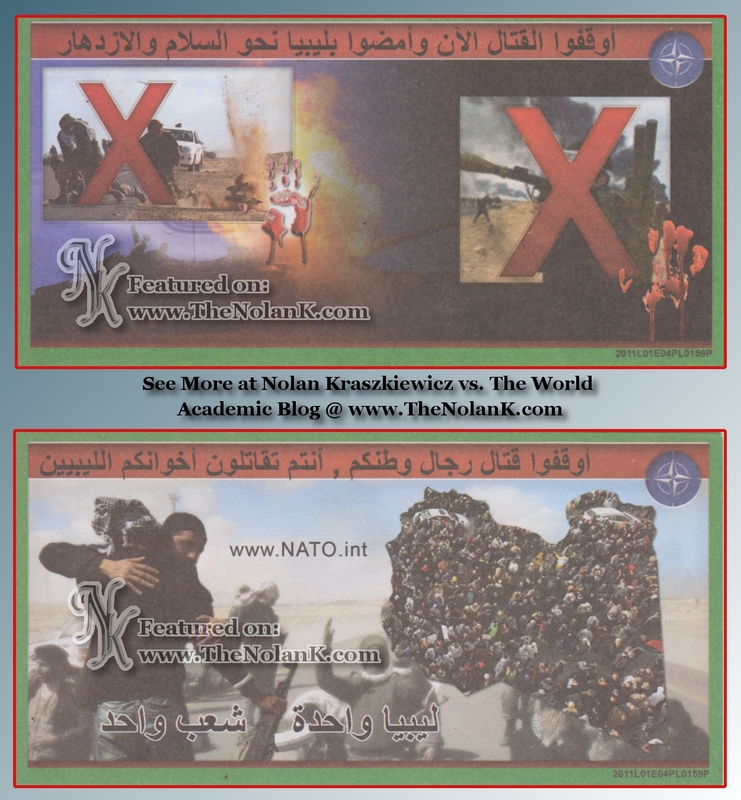 The forces of NATO will undertake all the necessary steps to destroy the war machinery that threaten civilians. Stop and distance yourself from the fighting now or when you see this helicopter the time will have passed. قوات حلف الشمال الاطلسي الناتو سوف تتخذ جميع الخطوات اللازمة لتدمير الآليات الحربية التي تهدد الدنيين. توقث و أبتعد عن القتال الآن أو عندها ترى هذه الطائرة الروحية فسيكون قد فات الأون. لا يوجد مكان للاجتباء. م يفت الوقت يعد للتوقف عن القتال. إذا إستمريت في تهديد الدنيين فسوف تتعرض للتدمير. Find these interesting? Check out my Foreign Policy page for a Research Paper on The Moral Question of Humanitarian Interventions, featuring case studies of Sarajevo in the context of the Bosnian War and The Success of NATO's Operation Unified Protector and the United States' Operation Odyssey Dawn. Arabic to English Translations: Ben Lydon, Masters in International Security, Sciences Po, Paris, France. 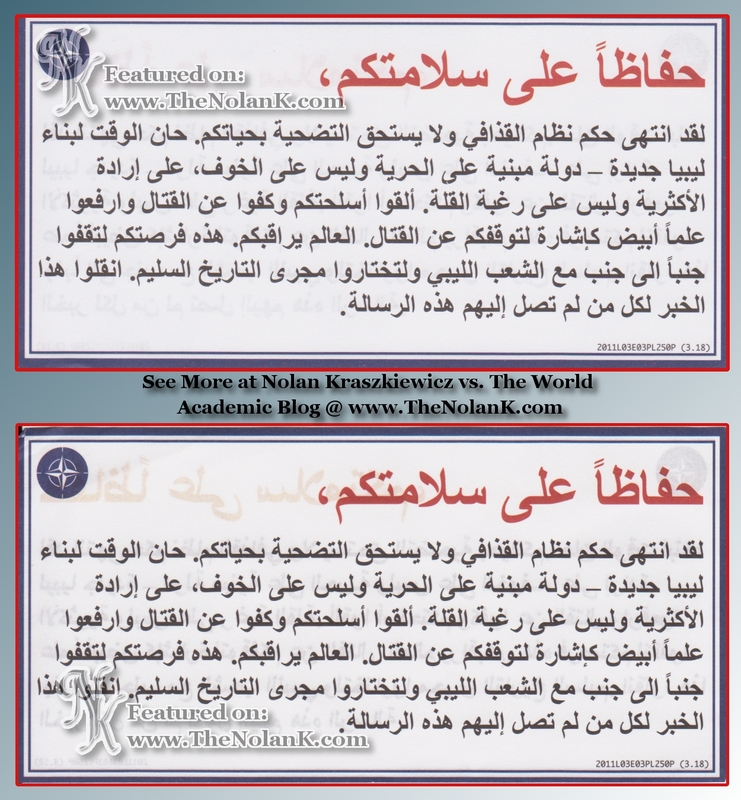 Arabic Script to Latin Alphabet Dictation: Jenna Dolecek, Wichita State University, Wichita, Kansas.